5 Best Xiaomi Yeelight Smart Light | Buy now or Regret Later! Home>Featured>5 Best Xiaomi Yeelight Smart Light | Buy now or Regret Later! Looking for a Philips Hue Alternative? We’ve it sorted it for you. Building a smart home, is no longer costly. In this edition, our editors have hand-picked the best cheap smart light alternatives for the Philips Hue based on several tests. So today we present you the “10 Best Xiaomi Yeelight Smart Light” you can buy in 2019. Smart Lights are emotional tuners that can help you achieve and maintain a good mood! Smart bulbs aren’t your average boring LED bulbs. These smart bulbs and strips by Yeelight can connect to your smartphone and can exhibit a wide array of colors, also offer remote adjustment of the cool to warm color temperatures using your smartphone. Also guess what! They can be integrated with Google Assistant & Alexa too! Anyways we are glad to share with you the cheapest smart lights by Yeelight that you will not regret buying. 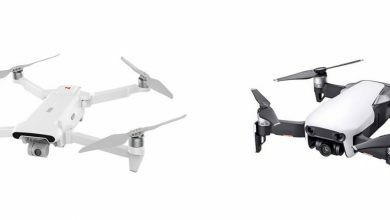 Also if you use our buy links to purchase on gearbest, we may get a commission but the choice is left to you. Yeelight YLDP02YL Smart LED Bulb is a colorful light bulb which turns out to be an amazing add-on to the Xiaomi Yeelight series. It gives you an amazing lighting ordeal. There are certain features like: Yeelight YLDP02YL shows 16 million colors RGB light and 1700 to 6500k changeable white light, thus offering the most tremendous lighting. Wifi technology controls the light from your bedroom to your backyard and the coolest fact is that it has super long lifetime of 11 years and imagine that you never need to replace the bulb. You have 16 million colors at your fingertip and it works with MIJIA, IFTTT and supports open API. The Yeelight YLDP02YL Smart LED Bulb can potentially provide colors for a range of 30 square meter. You can either group control it by handling bulbs or even a single one. It’s very much easier to install. It has passed Alexa certification and also works with Google assistant. With 220V, the product weighs only around 0.1450kg. You have sunrise, sunset, movie and many stable features with just 9 watts power consumption and there in-app slider to control brightness. Super long lifetime of 11 years and definitely worth every money! Buy Yeelight YLDP02YL Smart LED Bulb for just $19.99! Yeelight YLXD01YL 320 smart LED ceiling light AC220V is the world’s first lamp to support both WiFi and Bluetooth. The light comes in a circular shape and carrying the aesthetics of minimalism and a versatile design. It is fitted with 240 PCS OSRAM LEDs and contains a color rendering index up-to 95Ra. Do you remember lying down near your window as a kid and go to sleep as the cozy moonlight was spread across your room? That’s the effect given by the 95Ra, such cozy lighting. The customers have said that it brings museum lighting effect, where in museums give high importance to light effects for their artifacts. The dual chip 3 way dimming system allows a stretchable adjustment of brightness and color temperature. The moonlight mode seems to be surprisingly comfortable as the soft light provides good vision. Clean, dazzling, smart are the perfect 3 words to describe this Yeelight. Some of the awesome factors are, it takes only 5 minutes for installation, and it’s proved to be electric shock resistant and they’ve used IP60 for dust proof and can get rid of pesky insects hovering near the light. Simple on/off switch and the dimming system varies with color temperature range of 2700K to 6500K and brightness from 0.1Lm to 2000Lm. You can use a Bluetooth remote and APP remote control and even Mi band with the Yeelight YLXD01YL 320 for automatic turn off when you fall asleep. The uni-body aluminum plate maintains highly efficient cooling and the reality of red color plays an important role for picturing food and all the colors of people skin that’s achieved in Yeelight. Some of the customers called Yeelight as a caring partner and it was rated almost as the better one. Yeelight YLXD01YL is a stunning 28W Smart Light that will give a minimalist feel with its soft light projection. Buy Yeelight YLXD01YL 320 Smart LED Bulb for just $89.99! The Yeelight JIAOYUE YLXD02YL 650 surrounding Ambient lightning LED ceiling light is a starry lampshade which I would rate 4/5 by hardware. The light is big, bright and colorful. For a room size of 30 meter square, but with one light it seems that customers thought that it was not enough for the whole room, so they installed two. It has 2700K to 6000K color temperature and it is designed such that it takes only 5 minutes for installation. RGB strip light to giving out 16 million high quality light colors. And the CRI that supports high color rendering index up to Ra95. It has ultra-low brightness moonlight that has no disturbances and gives a beautiful night like feeling. Yeelight is built up with refracted light that is very much soft and protects the eye at a greater cause. You can link the Mi AI speakers to enable voice adjustment. The only bad thing is, the manual comes only in Chinese. For a few, the ceiling fixation was not working properly, and this product is lesser than what they have showed in the pictures. The group control does not allow to change the ambilight. And for some, the bugs kept appearing randomly that the light switched on sometimes without asking permission. 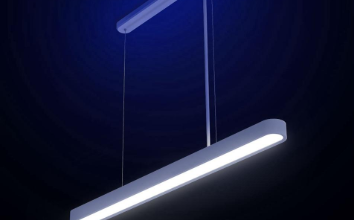 The Yeelight JIAOYUE YLXD02YL 650 uses a RGB strip light to emit 16 million light colors! Buy Yeelight JIAOYUE YLXD02YL 650 Smart LED Bulb for just $149.99! 4) Yeelight JIAOYUE YLXD05YL 480: Strictly for minimalist! Yeelight JIAOYUE YLXD05YL 480 LED ceiling light – White starry lampshade is a beautiful light that contains wide beam angle that makes the light illuminate to every angle of the space. The color temperature can be made to range between 2700K and 6000K. There’s huge range to adjust brightness and the special luminous effect for up to 2200lm and gives hyper brightness of 1.5lm with a distinct type of moonlight effect. The CRI that is the high color rendering index is upto the range of Ra95. Must easier and simpler to install for up to 5 minutes of time and contains IP50 that protects the light from dust and prevents it from the insects that fly near the light. They’ve used a built in CR2032 battery that provides free Bluetooth remote control for users. The remote control through MIJIA APP or Yeelight APP can also be used but customers prefer the remote control units as they are simpler. It contains a push in connection mechanism and is evenly distributed along the whole room. This light weighs around 1.7600kgs only and can provide amazing color temperatures of moonlight. Buy Yeelight JIAOYUE YLXD05YL 480 Smart LED Ceiling Light for just $89.99! The Yeelight YLDD04YL is 2m LED smart strip light that you’ll adore. It is definitely the best yeelight smart light strip by Xiaomi. 220V – white EU plug is a waterproof lamp to strengthen the feel and touch of area or your spot. This Yeelight product provides you the warmth of romance and the dreamy place that’s worth falling in love all over again. Be it your video game table or your bed. It will be right there to make it a happy place. These lights are the regulator of your personal thoughts and your attitude. The clean simple design of the strip of lights, the unique design of the PU material that is Mercury free soft gel which is easier to bend is especially used because of the easier way to clean surface ash. The Yeelight is energy saving, environment friendly and the best part is that you can cut the light strip as per your need of the space or area in which you need it to be. You can use an APP to control your 2m light strip from anywhere. Provided with smart voice control compatible with Alexa, Google assistant, can even just hang over the wall. To create your dreamy home, all you have to do is tear off the paper on the back and stick it anywhere you want. You can press the button for on/off control and long press for change of colors in the firm flexible strip and it has better intensity of colors and we can even make the lights dance as per music. There are no cons to it I guess. Buy Yeelight YLDD04YL 2m LED Smart Strip for just $31.99! 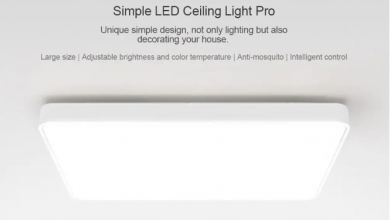 The U Torch UT30 Smart voice LED ceiling light is the most coolest and simple light that is compatible with Amazon’s Alexa and also Google Home. This product weights around 1.1360 kilograms. The LED light can be directed with voice commands or through Smart life APP and Wifi. There is no demand for any hardware or Hub. Want to set out the mood of lightning according to your personal wish? You can adjust the brightness by dimming the lights and you can switch up to three colors that are white, warm white, yellow. This gives a new look to your modern lifestyle. The Wifi connectivity seems to be stable for almost all the users and the response is highly good. This soft light gives more space as it is designed thinner and simpler. APP control is very easy with on/off light and brightness adjust for temperature of the light color alone to give you the completeness. The Intelligent voice control is responsible for the light controlling system that is done through Alexa and Google home. They claim that the light is dust proof and many have told that the “no glare” property of the light is true because of the LED’s being covered by the polarized lens. It’s easy to install and the minimalistic round design is loved my many and gives you the best look for a new house. Buy Utorch UT30 Smart Voice Control LED for just $33.99! Why should you buy a smart light? The concept of smart homes was majorly introduced in order to reduce your cost on the home appliances by making every device flexible to your needs without any additional cost. You should buy a smart light because you can simply control the color temperature, the color itself & even suit it to your mood with a help of an app or voice. You can schedule them to turn on and off automatically or luckily some of the above mentioned yeelight products are capable enough to turn off even without any scheduling. Smart Lights are emotional tuners that can help you achieve and maintain a good mood. Smart lights are a small addition to your room, but definitely makes a huge difference in terms of feel and aesthetics of your room. Hope you liked our list of the best Xiaomi Yeelight Smart Lights. If we’ve missed any worthy Yeelight Product then do share it on the comments below. Click Here for more Smart Light Offers: Want more suggestions on Smart Lights? Here are some more options & Offers!